A bill that would have added a $15 fee to each bail bond was held up in the Appropriations Committee yesterday and is now dead for the 2015 session of the California State Legislature. The California Department of Insurance was behind efforts to pass AB 1406 which, if passed, would have generated millions of dollars for the Bail Investigation and Prosecution Fund. This fund would have underwritten the costs to investigate complaints against California Bail Agents. Commercial surety companies and bail agents doing business in California already pay millions of dollars annually to the State of California and the California Department of Insurance, in the way of premium taxes, licensing fees and appointment fees, so the addition of a $15 per bond fee seemed excessive. AB 1406 faced opposition from the California Bail Agents Association, Golden State Bail Agent Association and the American Bail Coalition. This bill received support from a small group of bail agents who believe more investigation of the commercial bail industry is needed. As with every profession and industry there are going to be bad actors. These bad actors need to be rooted out. It was the opinion of many the State of California already receives sufficient revenue from the commercial bail industry to fund investigations of bail related complaints. Many viewed the proposed $15 fee as a tax on the commercial bail industry and it would have made it more costly for criminal offenders to bail out of jail. The best thing bail agents can do to reduce the number of complaints filed with the California Department of Insurance is to conduct business professionally and within the confines of the law as the majority of bail agents in California and across the Country do already. Two weeks ago I was in Trenton, New Jersey for a meeting of bail agents and representatives of the American Bail Coalition. At issue was the passing of S946 which created a statewide pretrial release system. Governor Christie was successful in pushing through this new bureaucracy that will cost New Jersey taxpayers hundreds of millions of dollars over the next ten years. While having lunch with a bail agent from Bakersfield, California last week I learned SB 210 was in trouble (trouble being a good thing in this scenario). Until a few weeks ago SB 210, which favored risk assessment tools and releasing defendants on their own recognizance was sailing through the California General Assembly after having passed out of the Senate. Upon my return to Indianapolis, I received an email from the American Bail Coalition that announced SB210 was sent to the inactive file, rendering it effectively dead. The email from the American Bail Coalition was forward to our readers so you know the amazing effort undertaken by ABC and their team to prevent SB 210 from becoming law. They were not alone; members of the California Bail Agents Association and Golden State Bail Agents Association were also involved with terminating SB210. Whenever bail agents and sureties work together as was the case in California, there is nothing that cannot be accomplished. Tenacity is one of the key characteristics of any successful bail agent and failure is never an option. Congratulations to those who stepped forward and fought to win this important battle. What we know about any undertaking is that failure is a possibility, but so too success. We may have had a temporary setback in New Jersey, but California’s effort was a success that will embolden bail professionals to keep pressing forward, to fight for the survival of a bail system that is the foundation of the criminal justice system. After all, without a defendant in court, justice cannot be carried out. Bail agents, you are the lynchpin that makes the system work; our state representatives just need to be reminded of this from time to time. Let’s continue to work as a team in preservation of our profession. A few weeks back I reported to you about an Ohio Supreme Court decision that told the Ohio lower courts they cannot prohibit a criminal defendant from purchasing a bail bond to secure their release. The courts could not limit the bond options to 10% cash only. On the west coast another high court took issue with the lower courts limiting the release options for offenders. The Washington State Supreme Court issued a ruling July 31, saying the lower courts could not prohibit use of bail bonds. Washington courts can no longer deny a defendant the right to use a third party guarantor, a sufficient solvent surety, to post bail use a cash alternative. Interestingly, deposit bail only surfaced in Washington State a few years ago. I specifically recall attending a Washington State Bail Agents Association meeting where I spoke about how deposit bail can spread from county to county like kudzu once other courts start hearing about the revenue that can be generated by the reduced cash option. There is nothing wrong with generating revenue, but the courts were taking just ten percent of the amount due people! That’s a fire sale and the ones getting burned are the citizens of that state as they see criminal offenders released from jail unsupervised by the hundreds and thousands. While the Ohio and Washington decisions are favorable to criminal defendants, taxpayers and the bail profession, New Jersey recently took a step in the opposite direction. With the passing of S946 the New Jersey Legislature approved a statewide pretrial release program with a rollout date of January 2017. This program is designed to release the majority of criminal defendants from jail pending trial with no bond requirement. These defendants would then be supervised by hundreds of new state employees costing taxpayers tens of millions of dollars each year. The American Bail Coalition has scheduled a meeting for August 19 at the Wyndham Garden Hotel in Trenton, New Jersey. Bail agents from around that state have been invited to attend and learn more about what S946 means for their future and what legislative options are available to minimize the burden on the taxpayers and public safety this new bureaucracy is sure to bring. The American Bail Coalition in cooperation with New Jersey bail agents had done a remarkable job educating state legislators and various civic groups on the positive impact the bail profession has on the criminal justice system and the unintended consequences of a statewide, public-funded, pretrial release program. I’ll be present for this meeting in Trenton to participate in efforts to preserve the bail profession in The Garden State. The only true way to preserve the bail profession and affect positive change is to combine our resources, work together and develop solutions. Hope to see you there. Indianapolis, IN – Lee Sexton, a general agent out of Ft. Wayne, had just completed his testimony before the Commission on Courts, chaired by Senator Brent Steele, R-Bedford. It was the afternoon of Thursday, July 18, and we were in room 421 of the Indiana State House. Lee nodded at me, as if to say, “You’re next.” I took a seat at the table and introduced myself. I must preface, I have no fear of testifying before a group; speaking about my chosen profession provides only exhilaration. I may even have been too eager to testify. “Yes,” he replied. Frankness, I respect that. With his answer in mind, I checked my confidence before stepping up to testify. As confident as I was, I knew that this was an important opportunity for the bail industry. Bail agents in Indiana have been waiting for many years to have the opportunity to speak frankly before a legislative body about the deterioration of the bail system in our State. This deterioration is the result of the encroaching deposit bail option, otherwise known as the 90% discount. It isn’t working. Several bail-related bills failed to pass earlier this year, prompting the state legislature to place bail in the summer study committee with the Commission on Courts. Sen. Earline Rogers, D-Gary, was instrumental in getting bail placed with the Commission on Courts. Her bill, SB 425, would redirect a portion of the late surrender fees on bond forfeitures to a newly created County Electronic Monitoring Fund for indigent defendants. This bill did not make it out of committee. In response, Sen. Rogers urged the Commission on Courts to permit her to present testimony in support of her bill. The committee obliged her with the condition Indiana’s bail system would be discussed in its entirety. I was one of a variety of bail representatives signed up to provide a testimonial. As I mentioned earlier, I jumped at the chance, eager to share my thoughts and experience. I began my testimony by answering a few questions posed to earlier witnesses: Yes, we can provide, today, a breakdown of Indiana Counties as to the percentage of bail being written versus the percentage of deposit bonds being posted directly with the court. Yes, we do pay bond forfeitures in this state. Six of the sureties companies and their agents paid one million in forfeitures in 2012. Yes, we can document this figure. Yes, there has been a steep decline in the number of bail bonds written over the past ten years. I also took the opportunity to launch an offensive on the deposit bail option that is favored by a number of counties throughout the state. I explained that courts have systematically repurposed bail, changing it from a guarantee of appearance to a guarantee of payment of fine and costs. Although the law says the court can set a cash deposit requirement to secure bail – up to one hundred percent of the bond but not less than ten percent – courts are using this as a tool of manipulation. They calculatingly set the percentage at ten percent, specifically to compete with bail agents who charge a ten percent premium as payment for a bail bond. Jailors in these county jails act as salesmen, pushing the ten percent option over a bail bond, telling defendants the premium for a bail bond is nonrefundable, as opposed to the mythical refund of their cash deposit bond upon completion of their case. That’s a persuasive sales pitch, coming from someone who literally holds the key to your freedom. Current Indiana law does not permit a criminal defendant to select for him or herself how they wish to secure their bond, be it full cash, real estate, or bail bond. A judge from Hendricks County, who later testified before the commission, said he believed that the method by which the bail is secured should be set at the discretion of the judge and not the defendant. This is analogous to a car salesman setting the price on a vehicle and then proceeding to tell the buyer how he or she is going to pay for it, be it lease, full cash, or bank loan. That level of power is an overreach. The judge went on to claim that deposit bail works. Nobody fails to appear in his court. He does not require a bail bonds, instead he sets a ten-percent cash deposit or releases defendants on their own recognizance. Amazingly, he immediately contradicted himself by explaining that when local bail agents had pointed out that he was indeed entering “failure to appear” on the record, he changed his procedure and reclassified these no-shows as “failure to perform”. He said some defendants had an acceptable excuse and should not be unfairly punished. I sat there wondering how he knows the excuse before he hears it from the defendant. He made it very clear his concern was for the defendant – he never mentioned public safety or the victims of these criminals. This judge’s inference was that he doesn't place the burden of obtaining a bail bond on these poor, unfortunate criminal offenders. During my testimony I mentioned, Marion County (Indianapolis) was generating 1250 “failure to appear” warrants each month, adding up to 15,000 a year. Some counties, who claim a bail bond is always an option, take evasive action anytime a bail agent attempts to post a bond. This stance only differs from the Hendricks County judge in method, using another type of avoidance to wipe out bail bonds. Looking back on the hearing, the testimony from the bail profession did an effective job of painting a picture, for the bi-partisan commission. The current bail system is broken. Deposit bail was exposed for what it is: a blatant effort to generate revenue for the counties at the expense of public safety, the assurance that defendants appear for court, and the adjudication of criminal cases. It has been proven time and again that bail bonds are the most effective form of pretrial release. Our job is to provide enough data to the Indiana Legislature’s Commission on Courts to where they can make the logical, fact based determination; a criminal justice system that employs a greater use of bail bonds is a more effective system. Michigan City, Indiana – Hoosier bail agents gathered in northern Indiana this past Saturday for the ISBAA’s annual spring meeting. The meeting was held at the Blue Chip Casino and included six hours of continuing education. All bail and recovery agents will need to obtain the required continuing education credits prior to license renewal this fall. This meeting was anticipated with a particular buzz of excitement, resulting in one of the larger turnouts in recent memory. Bail agents in Indiana are genuinely concerned about their future. The amount of bail written in Indiana has been reduced by more than 70% in just eight years. This sizable reduction can be attributed not to a reduction in crime, but rather an increase in the use of the ten percent cash option offered by the court. As I reported earlier this year, Tippecanoe County is the latest casualty. With just sixty days notice, this area, home to Purdue University, instituted a new bond schedule that included a ten percent cash option on all bonds $5000 and under. The bail agents in Tippecanoe reported an instantaneous reduction in business by as much as ninety-eight percent. This meeting included a two-hour panel discussion on the concept of repealing Indiana’s no-credit law and other ideas that could bring about positive change to public safety in Indiana and, by extension, the commercial bail industry. I was a member of the pane, which included Lee Sexton, Bob Dawson, Tony Widgery, John O’Byron and Josh Stroufe. The panel was moderated by Nick Wachinski. The panel discussion was cordial for the most part and heated at times. Bail agents in Indiana are very passionate about their profession. With current law requiring premiums to be paid in full prior to posting a bond, Hoosier bail agents are simply not familiar with the concept of payment plans. Many are slow to embrace the idea of credit bonding even though extending a payment option to their clients may be the very thing that can save their profession long-term. Indiana statute allows a court to offer a defendant a cash bond option of up to 100% of the bond amount and not less than ten percent. Court and county officials are no fools. Their goal is to simply use cash bail money to pay fines, costs and public and private attorneys. From the beginning, the courts viewed bail agents as a competitor and treated them as such. It was for this reason they cleverly set their cash deposit requirement at an amount equal to the premium charged by bail agents. Defendants would readily pay the court ten percent with no strings as opposed to a bail agent who has a host of conditions and requirements to ensure appearance, including a financial incentive to apprehend them, should they fail to show for court. As a member of the panel I did my best to paint an accurate picture of the current state of commercial bail in Indiana and make the argument that at this time in our state’s history, repealing Indiana’s no-credit statute and permitting a defendant to always have the option to post a bond is the answer to our problem. Making these changes would allow a bail agent to write bail in every county in the state. Facilitating this would be extending the option to a criminal defendant to pay their premium in installments, as they are able to do with a myriad of other products and services. Payment plans in no way lessens the surety’s guarantee of the full bond amount. Indianapolis, IN - An effort to repeal Indiana’s no-credit law on bail premiums failed yesterday. Amendment HB1006 #30 was offered by Senator Steele during the Senate Judiciary Committee. Senator Steele is a longtime supporter of commercial bail and public safety issues. The president of the Indiana Surety Agents Association testified in opposition to the amendment, specifically that portion dealing with the repeal of no-credit on bond premium. As a result, the amendment failed to pass. The proposed amendment did two things. Number one, it repealed the no-credit law allowing bail agents to accept payment terms on the premium. Current Indiana law requires bail agents to collect the entire premium prior to posting a bond. Number two; it is the defendant’s choice to post a full cash bond or a bail bond. Current law could be interpreted to say a judge can set a ten percent cash deposit bond to the exclusion of all other options. This legislative effort was initiated by American Surety Company and we are very proud of this fact. American Surety Company is the only bail surety company domiciled in Indiana regulated by the Indiana Department of Insurance. Indiana is our home court. We feel obliged to act in the best interest of all bail agents in this state. After years of watching other initiatives fail, we believed it was time to slaughter the sacred cow, that being no-credit. We sought support from other surety companies doing business in Indiana. The majority supported. We invited our agents to our office to discuss our proposals. The majority supported. We believe the American Surety agents we spoke with were a fair sampling of all Indiana agents. We calculated most bail agents in this state would recognize the need for repealing this antiquated law and the value of a law that would allow a defendant to opt for the type of bond they wish to post. Indiana is the last remaining state to not allow payment terms. Some Indiana bail agents wear no-credit as a badge of honor. In actuality, no-credit is more like a pair of handcuffs that prevent bail agents from competing against deposit bail. Of the 92 counties in Indiana, at least 37 have rooted out bail agents with deposit bail. The rest of the counties in the state offer a deposit bond option and some percentage of surety bail. Bail agents are at a major disadvantage because they cannot compete with the ten percent cash option, not if they must collect the full bond premium prior to posting a bond. Criminal defendants seeking release from jail will continue to select the path of least resistance, deposit bail. Why would a defendant pay a bond premium and put himself at the mercy of a bail agent and release conditions when they could simply deposit the same ten percent to the court with no conditions? If a bail agent was able to provide a defendant with payment terms, a number of defendants would start opting for a bail bond. Why, because it would be the easier path. Defendants and their family do not always have the money to cover the full ten percent without options they sit in jail. A lot of people need payment terms, a simple fact. We firmly believe a bail agent having the legal authority to offer payment terms to their clients and the defendant having the option to post a bail bond is the only way to compete with the ten percent option and reclaim market share in those counties where ten percent is an option and those counties where it’s the only option. The inability to pass Amendment # 30 was a critical opportunity lost. Bail agents would finally have something to look forward to rather than count down the days to their industry’s demise. American Surety Company will continue to use knowledge and common sense in our fight on behalf of bail agents and the preservation of the bail industry. If you are a member of the ISBAA I urge you to make your position known to them on the concept of repealing the no-credit law. After a three week lull in travel in early April, I was off and running again with trips to Texas, California, Georgia and Tennessee. Amid my travels I tried to keep abreast of critical legislative events occurring in Alabama, California, Colorado, Louisiana and Missouri. Alabama bondsmen tried in vain to defeat the implementation of an oppressive $35 bond fee while California bail groups make their opposition known on the Hancock bill (SB1180) that provides the first option of release to be on one’s own recognizance. We can trust them, right? Over in Colorado there was a harmony of efforts to continue the authority of the Division of Insurance to regulate bail through 2017. It appears all interested parties walked away happy though not fully satisfied. That’s when you know it’s the best you’re going to get. The commercial bail community in Louisiana has its hands full curtailing the expansion of ten percent cash bail and the encroachment of taxpayer funded pretrial release. Then there is the Show Me State whose bail agents are supporting the passing of a measure that says, Missouri courts cannot set a cash-only bond. BTW, this is already provided for in that state’s constitution. See Article One, Section 20. As always, you only need click on our 2012 Bail Bond Legislative Update to review bills from these states and others across the county to see what legislative measures can impact bail in your market. On the travel schedule, next month I’ll be a guest instructor at a continuing education class presented by the Oklahoma Bondsman Association speaking about public pretrial release programs. From there I’m scheduled to attend FSAA’s 40th Anniversary Celebration in Cocoa Beach, PBUS Mid-Year Meeting in San Diego, the MBAA General Assembly Meeting in Bay St. Louis and the PBT 3rd Quarter Meeting in Ft. Worth. The PBT meeting coincides with the 23rd Annual Steven G. Whitlock Memorial Golf Tournament August 1st, where we anticipate raising a significant donation, with tremendous help from generous bail agents to underwrite the costs of sending as many as 85 kids who are battling cancer to Camp Esperanza. This is a day I look forward to every year. All bail agents should support their state and national associations with their time and money. Without these valuable entities the commercial bail industry would be defenseless against those who seek to eliminate our profession and replace bail with yes, an air sandwich. That’s all for today, I have to get downtown for Indiana’s spring meeting of bail agents. It’s going to be a blockbuster. I love to go to movies. I’m looking forward to seeing The Avengers this weekend. If ever I heard of a movie that had a bounty hunting priest hired to track down fugitives for Church’s Bail Bonds I would certainly go. The reason I like going to movies is to escape reality for a few hours. In the case of a church writing bail, this could be the reality in Michigan if HB 5533 were to pass. HB 5533 would create “Charitable Bail Organizations” who could act as surety on a bail bond for no compensation. If you’re a sinner charged with an ordinance violation, misdemeanor and yes, even a felony, under HB 5533 you could ask your local church to post your bond and you wouldn’t even be required to toss a few bucks into the collection plate. Actually under HB 5533 you don’t have to be an organized church, you simply have to be an organization qualified as a 501(C)(3) under the Internal Revenue Code and MCL 400.271 to 400.294 specifically setup to post bail on behalf of “poor” individuals. Notice they do not use the term “indigent” rather “poor”, which is subjective as in your poor soul. HB 5533 states a court shall allow a “Charitable Bail Organization” to become a surety on a bail bond. There is no mention about how the court will collect forfeited bonds from these organizations or whether or not they have the authority to apprehend fugitives. There is no question HB 5533 needs to be defeated. The Michigan court system already has the latitude to release a defendant on their own recognizance. Unless you’re a charity golf tournament with a foursome trying to get their A player out of jail before their 8:00 a.m. tee time, nothing good can come from authorizing a 501(C)(3) to post bail. What will they think of next? New Jersey Governor Chris Christie, in his recent State of the State address, called for no bail for repeat violent offenders. Christie said, “We can only improve our quality of life by keeping the most violent criminals off the streets”. This is not a new direction for New Jersey. Last November, Governor Christie signed into law A 1491, which expanded the current list of criminal offenses carrying a bail restriction, to include crimes involving domestic violence. Anyone arrested for a charge of an aggravated nature like sexual assault, robbery, carjacking and now domestic violence must either post full cash, a bond secured by real estate or a fully insured bail bond. This class of offender cannot be released on their own recognizance or a ten percent cash bond. The peoples’ representatives of New Jersey and their governor clearly understand the public safety ramifications of releasing offenders charged with aggravated offenses on anything less than a fully secured bond. This is public policy safety minded residents can support. Conversely, we have bail states like Indiana, Ohio and South Carolina and nonbail states in Oregon, Wisconsin, Illinois and Kentucky with judges and legislators willing to release with regularity offenders charged with aggravated offenses on a mere 10% cash deposit of the full bond amount. The logic being, a defendant will return to court if there is a chance of getting the deposit money back. Requiring aggravated offenders to post a bail bond to guarantee their appearance in court is sound public policy. In what universe do individuals who perpetrate crimes on individuals deserve a 90% discount or a free bond? Citizens living in and around communities with these soft release policies have a right to be concerned for their safety. Who would have thought you would need to move from northern Indiana to New Jersey to feel safer. Every state should have bail restriction laws identical to The Garden State. While in the Mile High City last week, I met with some of our bail agents, attended a meeting of the Committee on Criminal and Juvenile Justice (CCJJ) to hear a presentation on bail bonds and made a guest appearance on "In the Lobby" on WKRP Radio to discuss the bail bond industry. The Colorado Bail Industry has been hit pretty hard lately. Not only because of the poor economy, but also because some courts have stopped setting surety bonds in lieu of small cash bnods with no option of posting a bail bond. You may recall my reporting on SB11-186 (Alternative Bond) last year. This bill would have created a percentage cash bond managed by the local public Pretrial Release Agency. After a lengthy legislative battle SB11-186 failed to pass. Look for a similar bill to be in the upcoming session. The CCJJ was behind the effort to introduce the Alternative Bond and it was a representative of the CCJJ who was called to the carpet during a committee hearing for not inviting a representative of the bail industry to sit on their committee. The CCJJ took immediate steps to remedy this oversight by inviting current PBAC President and local bail agent Steve Mares to join their committee. The CCJJ held a meeting January 6 in Lakewood, Colorado where Steve Mares and fellow bail agent, Jason Alexander, made a two-hour presentation on commercial bail bond procedures. I attended the meeting as a spectator; only committee members were allowed to comment. Steve and Jason did an excellent job with their presentation. They took a number of questions from the other committee members. One in particular, is it true most defendants who FTA while out on bond are arrested by law enforcement? Steve did a great job dispelling this myth by explaining 1) bail agents will make every effort to reinstate a bond without surrendering a defendant if there was no intent on the defendant’s behalf to flee; and 2) many times when a bail agent is surrendering a defendant to the county jail the duty officer will not provide a body receipt opting instead to put themselves down as the arresting officer in order to receive credit for the arrest. With the officers taking credit for the arrests it creates a false impression that bail agents are not responsible for the recovery of their fugitives. Committee members seemed to grasp the explanation. Before I made my trip I was invited by lobbyist Cork Kyle to be a guest on his daily radio show, "In the Lobby". I appeared on air last Wednesday and thoroughly enjoyed my first opportunity to do radio. While nervous at first, I quickly got into the discussion, as I'm quite comfortable when I’m talking bail. It was a friendly environment as Corky represents the Rocky Mountain Bail Agents Association and it was a good experience. (Listen to my radio interview). All eyes will be on Colorado again this legislative session watching for another effort to pass Alternative Bond legislation. The Colorado bail industry will also be working with the legislature on the proposed Sunset revisions. The regulation of bail by the Colorado Department of Regulatory Agencies is up for renewal and there have been several recommendations made by The Bail Bond Advisory Committee established last year. I will keep you posted as the situation develops. It’s a new year with new challenges. Together, as a cohesive unit, we continue to promote the effectiveness of commercial bail bonds as a critical component of the criminal justice system. Click on the picture to listen to my radio interview. Benjamin Franklin was known to have said, the only things certain in life are death and taxes. So, while we believed the return of commercial bail to Wisconsin was certain, alas it was not to be, yet. The amendment to the Wisconsin State Budget that would have returned the use of commercial bail bonds back to the State was stripped from the budget by Gov. Walker. Reinstituting commercial bail would have resulted in improved appearance rates, millions of dollars in annual revenues generated from license fees, premium taxes and bond forfeiture revenue and more than 1000 new jobs. Gov. Scott Walker stated in his Veto Message, " ...this (bail) provision..does not provide sufficient time to properly evaluate the proposal and to plan for appropriate regulation of this industry prior to the date of implementation." The governor's statement went on to say, "I agree with the intent of the provision to reduce local government administrative costs and ensure defendants show for court dates." It has been more than thirty years since commercial bail was unceremoniously eliminated in Wisconsin through an amendment to the budget introduced in 1979. There was no debate, no discussion and no planning for a criminal justice system without the most effective release option available to secure a defendant appears for court; a bail bond. By the beginning of 1980 Wisconsin was using a monolithic cash bond system carrying no guarantee of appearance; the court would make a lot money at the expense of victims of crime and public safety. Gov. Walker has acknowledged, "the commercial bail bonds industry works well in many other states" and inferred that separate legislation reintroducing bail bonds to Wisconsin would be a worthwhile effort. The American Bail Coalition will continue efforts to return commercial bail to Wisconsin as an option for ensuring a defendant appears in court. Down but not beaten. Then there were three. Wisconsin is one of four states that currently does not permit money bail. This may change as early as today. The Wisconsin legislature approved the budget yesterday and shipped it off to Governor Walker for his signature. The budget includes the reinstatement of commercial bail in Wisconsin which has been outlawed in this state since 1979. The American Bail Coalition, of which American Surety Company is a proud member, has been behind the effort to bring commercial bail back to Wisconsin. While ABC has been working the last three years to bring bail bonds back to Oregon, the process in Wisconsin has been significantly different. With the Republicans winning control of both the House and Senate after the 2010 Mid-Term Elections, the state has been in a private sector fervor ever since. ABC simply introduced the idea commercial bail bonds is a private sector solution to increasing the appearance rate of criminal defendants which has suffered profoundly in the last thirty years under a public release program. Should Governor Walker sign the budget as submitted, commercial bail will be back in Wisconsin as a release option for criminal defendants. Well done Wisconsin Legislature and well done ABC! The Alternative Bond bill SB11-186 died last night, after being assigned to House Appropriations, as the 2011 legislative session ended. The Alternative Bond, at its core, is a scheme for Colorado courts to engage in the bail bond business by collecting premiums normally paid to bail agents for posting a bail bond. Unlike the bail bond agent, the courts would have no risk of paying the full bond if a defendant was not timely rearrested after a failure to appear. This concept is taken from the old government playbook; take your money with no responsibility to perform and cloak it in a disguise of being in the interest of public safety. SB11-186 had passed through the Senate last week by the narrowest of margins (18-17) and simply did not have sufficient time to get through the House, or did it? It is more likely that the arguments and evidence offered by the commercial bail industry was sufficient enough to erode support for SB11-186 in the House. Some House members simply could not support adding several hundred bail agents to the unemployment scrolls, while at the same time costing the state millions of dollars in annual revenues generated by the bail industry. As House Sponsor Rep. Waller testified yesterday when the bill was heard before the House Judiciary Committee, “I don’t want to see even one bail agent put out of business”. The CCJJ is comprised entirely of public servants, with the possible exception of three at-large members which could come from the private sector. CCJJ representatives testifying in support of SB11-186 were chastised by members of the Judiciary Committee for not having invited a member of the commercial bail bond industry to participate in discussion regarding an alternative bond concept. In reading the CCJJ Bi-Laws, such an appointment may be prohibited in that any member must recuse him or herself should they have a pecuniary interest in the subject matter. Well, that pretty much leaves out the private sector in general as every taxpayer in Colorado has a financial interest in matters discussed by CCJJ. There are 26 members of the CCJJ. Senator Morse and Representative Waller, the Senate and House sponsors of SB11-186 are both members of this commission. In addition to the 26 members of the commission there are several subcommittees i.e. Behavioral Health, Comprehensive Sentencing, Drug Policy Task Force, Legislative, etc. These committees are comprised of public servants ranging from police chiefs to various heads of probation departments. No one from the private sector, save a private defense attorney, has been included. The commercial bail bond industry’s fight to preserve bail in Colorado was unprecedented and most importantly successful, this time. Representative Waller and members of the bail bond community agreed to work together over the next year to discuss issues relating perceived problems with the expedited release of pretrial detainees. This is a welcome opportunity because if you’re not part of the solution, you’re part of the problem. We only need to be invited to participate. Thus comes the end of a very long two months. What was it the ring announcer said after Rocky fought Thunderlips (Hulk Hogan) to a draw in Rocky III? “Thank God”, (it’s over). There has probably been no greater counteroffensive mounted by the bail bond industry than the one brought about in Colorado in opposition to SB11-186 – The Alternative Bond bill. Public funded pretrial release proposed the bill early this year and the bail bond industry has responded with an all out assault on this government intrusion into the private sector. It’s a fair fight. The legislative battle over SB11-186 has yet to be won and in comes Americans for the Preservation of Bail (APOB) with the introduction of HB11-1306 which would push the sunset of bail regulations from 2012 to 2017. At first look why wouldn’t this be good for the bail bond industry? After all they gave an extension to all other forms of insurance. Well, the bail bond industry is used to getting the short end of the stick. Be that as it may, we fight the battles that need fighting and we move forward. In the case of Sunset, the bail industry has not been sitting in an easy chair watching reruns of Cheers; we’ve been working with DORA’s designee for Sunset review for the past several months. Surety company members of the Colorado Bail Bond Round Table (CRT), who collectively write 90% of the bail in Colorado, have been in regular discussions with DORA and had been making good progress when out of nowhere, HB11-1306 was filed. This bill is no more than a sucker punch by APOB which has only served to embarrass the bail bond industry and undermined CRT’s efforts to work with DORA in a meaningful and constructive way. CRT and its members (Accredited Surety and Casualty Company, Inc., Allegheny Casualty Company, American Surety Company, Bankers Insurance, Fairmont, International Fidelity Insurance Company, Pioneer General, Lexington National Insurance Corporation, Sun Surety and Safety National) have renounced this move to derail efforts to protect and preserve bail in Colorado. I personally urge all bail agents in Colorado not to support HB11-1306. I encourage each of you to contact your surety company to confirm their position on this bill. In spite of what you may be hearing from other sources, your surety company is working to protect your livelihood. Without you, the bail agent, we have no business. Meaning, your surety will not act against your best interest. So, the question is, “Are you going to listen to a group of surety companies representing the large majority of bail written in Colorado or other groups that represent less than 10% of that market”? It’s a no brainer. Last week the Senate Appropriations Committee passed SB11-186 out of committee by a 5-3 vote. Committee Chair Senator Steadman moved the bill to the front of the line when three committee members opposing the bill were delayed (they were caught in traffic). Senator Steadman refused a request for another vote by the belated senators in opposition to passing SB11-186 out of committee, opting instead to take the bill to a floor vote. One has to wonder how a bill that has been determined, if passed would have negative fiscal impact of $500,000 to Colorado’s general fund, could pass out of the Appropriations Committee. Politics replaced the public interest in this case. SB11-186 is scheduled to be heard on the Senate floor today. Surety company members of the American Bail Coalition and the Colorado Bail Roundtable, whose members collectively write 90% of the bail in Colorado, have made their opposition to this bill clear, SB11-186 is bad for the bail industry and bad for Colorado. We hold out hope the collective Senate will see the wisdom of voting no on SB11-186. Senate Bill 11-186 was scheduled to be heard today in the Senate Appropriations Committee when Senator Morse, the bill’s sponsor, didn’t show. The bill was ordered held over by Senator Steadman and is expected to be heard next week. It’s very likely Senator Morse has seen the writing on the wall and believes his bill is fated to fail. SB 11-186, should it pass, would run bail agents out of business once the courts began releasing criminal defendants from jail on unsecured bail. Such a move would not only place Colorado bail bond agents on the unemployment scrolls, it would cost the state millions of dollars in lost revenue generated annually from the payment of premium taxes, licensing fees, court costs and bond forfeitures. The negative fiscal impact SB 11-186 would create for the state is what has given pause to those legislators considering this measure. Like every other state in the country Colorado is looking for ways to increase revenues, not do away with a steady flow of income as is provided by the commercial bail bonds industry. Of course, there is also the issue of bail bond agents providing a critical role in the criminal justice system by getting defendants to court and recovering those who fail to appear at no expense to taxpayers, but these days it’s all about the Benjamins. Gone are the days of the bail agent justifying their purpose and function by stating ‘we get our man to court’. That is, if our defendant decides not to show for court, we track him down and return him to the custody of the court at no cost to the taxpayer, and in those few instances where the defendant cannot be located, the bond is paid in full. Private sector commercial enterprises that assume risk for a profit and carry out their responsibilities, to the best of their abilities in order to avoid loss are under attack by state government entities who seek to put us out of business by getting in our business. Colorado Senator John Morse, sponsor of the bail industry killing legislation known as SB 186, said it quite clearly when introducing his bill to the Senate Judiciary Committee earlier this month, “the courts want to get into the bail bond business”. The bail bond industry demonstrating its superior effectiveness of government pretrial release programs and deposit programs is no longer all that is needed or required to defend against unwanted government competition. Commercial bail must now show our industry’s revenue generating component, one that is fiscally positive to the counties and states where bail bonds are utilized. There are several ways where commercial bail can and does generate revenue for counties and states. First, there are tens of thousands of dollars generated from licensing bail bond agents and appointing agents with surety companies. There are hundreds of thousands of dollars paid in premium taxes by the surety companies in every state, every year. There are millions of dollars paid in bail bond forfeitures where a defendant could not be located within the legal time frame. These are tangible and calculable dollars that can be gathered and offered as evidence of the commercial bail industry’s positive fiscal impact on state revenues. Harder to quantify are the intangible savings to county and states courts and law enforcement agencies. Thousands of man hours go into seeing defendants appear in court and tracking and retrieving those defendants who have failed to appear for court. In order for the commercial bail industry to effectively fend off unfair government competition, bail agents and sureties alike must begin logging and documenting costs associated with the apprehension and return of fugitives and losses paid in those instances where a fugitive cannot be returned. This information should be gathered by state associations and insurance associations where the data can be batched and included in a useable and comprehensive report. This past Monday SB11-186 was introduced after the filing deadline through the use of a procedure maneuver. SB11-186 would create an alternative bond with a self-funding mechanism for the expansion of an already self-righteous, rights bludgeoning pretrial services agency. Funding would come through the implementation of a deposit requirement of which pretrial services could require a deposit of up to 15%. Of the amount deposited, pretrial services would retain 50% of the deposit while the remaining 50% of the deposit would be applied to fines and costs upon conviction. Once alerted to SB11-186, the Colorado bail community came together quickly, holding several meetings on Tuesday to develop a strategy and coordinate testimony on how to derail SB11-186. I was fortunate enough to be in the area and attend these meetings on behalf of American Surety Company and as a representative of the American Bail Coalition (ABC). Earlier on Tuesday, ABC had retained the services of a lobbyist to represent the interest of the surety companies and their bail bond agents doing business in Colorado. A large of number of bail bond agents answered the call and turned out for the Senate Judiciary Committee Hearing held Wednesday afternoon. Testimony came from Dave Hyatt of Pioneer, six bail agents and myself. Also testifying was attorney L. Jay Labe, chair of the Colorado Bail Round Table. Opposition testimony centered on the job killing, revenue killing impact SB11-186 would have on the bail industry and the State of Colorado. Those in favor of the measure said the proposed Alternative Bond is just another option for the judge to consider when releasing a defendant. Harmless. What was not said was pretrial services employees were in a unique position to influence a judge into routinely requiring the Alternative Bond and release through pretrial services thus slowly eradicating commercial bail and putting hundreds of bail agents out of work and thousands of failure to appear warrants on the books. In the end, the prospect of losing more than $500,000 in annual premium taxes to the state general fund was enough for the committee to send SB11-186 to the appropriations committee where the fiscal impact of passing SB11-186 can be considered. While SB11-186 is not dead it has been delayed. Any bill that is deemed to be fiscally negative (will cost the state money) has little chance of passing in these cash strapped days of budget deficits. I’m a huge fan of the hard working bail bond agent and I was very impressed with how bail agents and surety companies worked together in a very short period of time to protect the commercial bail industry in Colorado. This spirit must continue if we are to ultimately defeat this legislation, which is not only bad for the bail industry but bad for Colorado. What's not to like about Colorado's Proposition 102? It seems like only yesterday I was in Denver attending a very brief, but required hearing to advance a ballot initiative in Colorado. As I reported to my readers at that time, an organization called Safe Streets Colorado was pushing an initiative to limit the use of Pretrial Services to first time criminal offenders and misdemeanants. Getting an initiative on the November ballot, Safe Streets Colorado would require obtaining nearly 75,000 validated signatures on petitions in support of the initiative. A daunting task, but with the help of the Americans for the Preservation of Bail (APOB), Colorado bail agents’ and concerned citizens’; 172,000 signatures were submitted to the Secretary of State on August 2nd. According to APOB this is the most signatures ever submitted in support of a ballot initiative in Colorado’s 132 year history; quite an achievement. After overcoming a legal challenge over a filing deadline set by the Secretary of State, the Secretary of State certified the initiative as Proposition 102. I’ve had a number of conversations with bail bond agents in Colorado and around the country about the choice of taking the issue of Pretrial Release and the release of criminal defendants from jail at taxpayer expense to the taxpaying citizens of Colorado. Some agents I spoke to believed this was absolutely the right path to take while others preferred the legislative process. The bail bond industry in Colorado has suffered for years from an apathetic and incongruous bonding community. Colorado has been unsuccessful in their efforts to form a cohesive bail agent association similar to what we see in California, Oklahoma and Texas, etc. As a bystander, I’ve not seen anything like this in my 28 years in bail. I find the effort which has taken place in Colorado to be very intriguing and I’m anxious to see the result. To APOB’s credit, they saw an opportunity to bring Colorado bail agents together under a common cause and in doing so have done the near impossible, placing an initiative on the November ballot that would severely limit the use of Pretrial Release. Should Proposition 102 pass, and I believe it will, it will be seen as a huge victory not only for Colorado Bail Agents but the citizens of Colorado who are tired of seeing their tax dollars used to provide free bail to criminal defendants. If I was a citizen of Colorado, I would vote yes to Proposition 102. I would be interested to hear your comments on Proposition 102 and the course taken to limit the use of taxpayer funded Pretrial Services in Colorado. Click here to send me your thoughts. Over the last several years the Commercial Bail Industry has applied a forward press against unsecured release options, pretrial release, deposit bail and excessive OR releases by legislatively establishing that offenders charged with certain felony offenses would be ineligible for release on an unsecured bond without direct authorization by an elected judge. The Georgia Association of Professional Bondsmen (GAPB) followed a productive 2009 legislative effort with the passing of ground breaking legislation that requires GPS monitor providers to act as surety and the granting of bond exonerations for defendants who have been deported by passing bail restrictions legislation. HB 889 received a favorable vote in the House yesterday and will now be sent to the governor to be signed into law. Once signed, HB 889 will severely restrict the ability of offenders charged with a broad range of felony charges from being released through pretrial service programs and on their own recognizance. HB 889 requires an elected judge to directly approve the release of a defendant charged with certain felonies through a release option other than a secured bail bond. This is great news for the citizens of Georgia who have have been living in an environment where offenders have been regularly released from jail pretrial with little or no supervision and no one guaranteeing their appearance in court. HB 889 will also have a direct impact on business for bondsmen operating not just in Atlanta where pretrial release has a significant presence, but statewide. Georgians will also see a lot less of their tax dollars going to fund free bail for criminal offenders and instead see it redirected towards law enforcement and education. The passing of HB 889 is a big win for commercial bail in Georgia and a positive indicator for what can be achieved in the interest of public safety and commercial bail nationally when we work together as a team. GAPB was assisted in their efforts by the American Bail Coalition and the American Legislative Exchange Council and Rep. Len Walker. Well done all! Click Comment above if you would like to comment on this blog. I was in Denver last Friday to attend a brief, though not insignificant, hearing in the basement of the Colorado State Capitol. The hearing, which lasted no more than 15 minutes was a procedural step in moving forward a ballot initiative that would require the posting of a secured bail bond for all crimes other than a first offense, non violent felonies or misdemeanors. The ballot initiative is being put forth by an organization called Safe Streets Colorado. In order to get an initiative on the ballot for the upcoming November election, Safe Streets Colorado must obtain 5% of the voter turnout in the most recent election held for the Secretary of State. In this case, 5% equals 76,000. There are significant costs involved with a ballot initiative. They will need a website and the production and advertising costs for print, TV and radio spots. The projected need is between $800,000 and $1.4 million in contributions in order to get this initiative placed on the ballot. Safe Streets Colorado, whose website is scheduled to go up April 12th, plans to launch a $15 donation campaign so all citizens of Colorado can afford to participate in an effort designed to protect their neighborhoods and streets from criminal offenders released pretrial without a secured bond. Bail bonds agents in Colorado and around the country should pay attention to this effort and make a contribution if you believe it is the right thing to do. 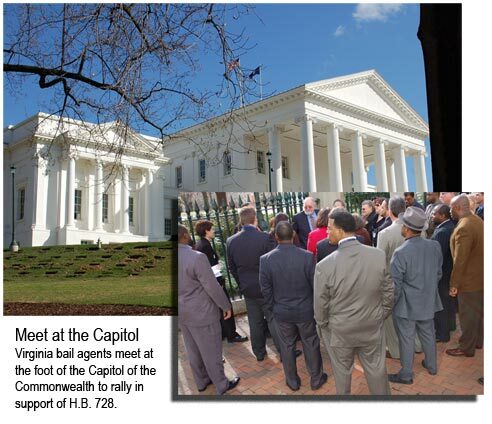 We have been keeping you informed, through our American Surety Company Legislative Update, about the ongoing efforts of Virginians for the Preservation of Bail (VPOB) to bring about reform of taxpayer funded Pretrial Services in the Commonwealth. VPOB introduced H.B. 728 which would require an offender to be brought before a judge and determined to be indigent before they can be released through a pretrial service agency. I traveled to Richmond, Virginia this past Tuesday to attend the first hearing on H.B. 728. A number of bail agents, both surety and property writers, met outside the General Assembly Building adjacent to the Capitol Building to show their support for H.B. 728. Supporters waited several hours before H.B. 728 was finally brought before the House of Delegates Subcommittee for Courts of Justice. Delegate Dave Albo, the Committee Chair is the sponsor of H.B. 728. After hearing testimony from supporters and opponents of the bill, H.B. 728 was passed out of committee on a 5-2 vote. A second bill, H.B. 1255, would allow a licensed bail bondsman to purchase a copy of criminal history records, was also passed out of subcommittee. Both H.B. 728 and H.B. 1255 will now be brought before the Full Committee for Courts of Justice today, Wednesday, January 27, in the General Assembly Building in Richmond. A large number of bondsmen will be on hand to support this critical legislation. Thank you to all the Virginia bondsmen and the VPOB, in particular, for their efforts in working to correct the overfunded and ineffective pretrial release services in Virginia. Jefferson City - The Missouri State Legislature passed legislation earlier this year, a 62 page bill (H.B. 577) which, in part required the Missouri Department of Insurance to "conduct a study regarding its licensing rules and other policies and procedures governing the bail bond industry". H.B. 577 suggested the Department of Insurance hold hearings and permit testimony from representatives of law enforcement, judiciary, bail agents and surety bail bond companies. Four hearings were held with the last hearing held at the state capital on Tuesday, November 10. I attended that hearing. Approximately 15 people sat on the panel hearing testimony, of which several were bail agents. Testimony was largely given by bail agents writing on personal assets identified in Section 374.700 of the Missouri Revised Statutes as a Property Bail Bondsmen. The testimony from some of the property agents keyed on the low barrier of entry to becoming a General Bail Bond Agent in Missouri. Current statute allows licensed agents of two years or more to qualify as a General Bail Bond Agent upon deposit of $10,000 with the state. Bail agents can only write through a licensed General Bail Bond Agent, whether on corporate surety or personal surety. Another issue raised was the qualification process for property writes. There was testimony some courts were not properly vetting property bondsmen and were not sufficiently securing the assets (cash, real estate or personal property) by way of deed of trust or assignment and that assets listed on financial statements were not being verified. Some courts have discontinued the qualification process all together due to a lack of resources. I was the only surety company representative to provide testimony at this hearing. I recommended to the panel, if they intended to continue to allow for the writing of bail against personal assets, they should look to Texas and South Carolina which have refined their procedure and controls for writing bail using personal assets as collateral to a point where they are suffiicently indemnified. Both states have corporate surety bail agents as well, providing comparable circumstances to those of Missouri. H.B. 577 requires the Department of Insurance to submit their recommendations to the house and senate insurance committees no later than January 6, 2010. I will attend the Fall Conference of the Georgia Association of Professional Bondsmen in Savannah on November 16 and 17. Hope to see you there.